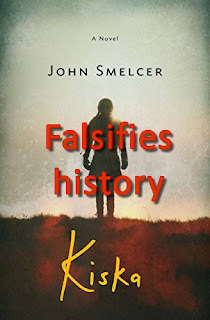 Historical fiction shouldn’t lie about history. This book does. But historical fiction shouldn’t lie about history. This book does. This book’s author and publisher rely upon the ignorance of readers and reviewers for any success this novel might have. The book’s “Questions for Discussion” and “Resources for Further Study” indicate a plan to market the book to educators for use in classrooms. I object to intentionally teaching falsehoods to middle schoolers (or to anyone else for that matter.) 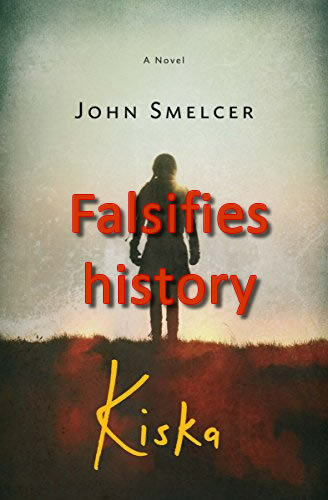 This review is intended to correct some of the distortions of fact contained in this novel, and to offer some resources to supplement the wholly inadequate “Resources for Further Studies” bibliography included in Kiska. Kiska is framed as a story told by the eponymous character — named after one of the two islands of the western Aleutians that the Japanese had invaded — recounting her World War II experiences to a visiting granddaughter. She begins her tale with June 4, 1942, a date she remembers clearly because she’d been marking off days on the calendar to her 14th birthday, just days away. Later in the day, a distant rumbling is heard from the east. “Sounds like thunder coming from Dutch Harbor,” her father says. But by the end of the first chapter, the radio announces the truth of the matter: it wasn’t thunder, but Japanese planes attacking Dutch Harbor. In the following chapter the U.S. Army Transport Delarof arrives without advance warning to evacuate Kiska’s village. When the villagers board the ship, they find residents of another village already aboard, and the ship’s dingy hold becomes increasingly crowded as the Delarof steams to seven other villages to evacuate their residents. The Delarof takes the full complement of 811 evacuees to Southeast Alaska. Along the way, Kiska’s infant niece dies of pneumonia and is buried at sea. Although Kiska and her family are from one of the eastern Aleutian islands, they are inexplicably put ashore with residents of the Pribilof Island villages of St. Paul and St. George. Housed in an abandoned salmon cannery at Funter Bay on Admiralty Island, they struggle to survive inadequate housing, cold, lack of food, disease, neglect, and the oppression of Fish and Wildlife personnel and white soldiers whom the evacuees call “Keepers.” Kiska, guided by an old man Agafon who is rumored to be the “last shaman,” secretly learns to fish and hunt in order to help her people. Delarof didn’t carry all evacuees. 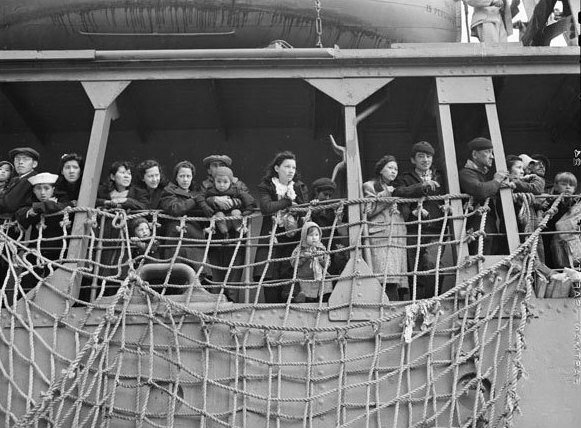 The 811 evacuees from the nine Unangax villages are shown as having all been evacuated by the same ship, the U.S. Army Transport Delarof. In fact, the Delarof directly evacuated only St. Paul & St. George, then sailed to Dutch Harbor to bring aboard passengers who had been previously been evacuated from Atka village (most by another ship, some by seaplane a few days later). After boarding the Atkans, the Delarof, with a passenger capacity of 376, carried a total of 560 evacuees — still unhealthily crowded, but also 321 people fewer than this story crams into the hold. St. Paul Residents Evacuated on U.S. Army Transport Delarof, June 15-16, 1942. Why did the author decide to lie about history by evacuating everyone all at the same time, and all aboard the same ship? One of the books which details this — Dean Kohlhoff’s 1995 history When the Wind Was a River: Aleut Evacuation in World War II — is in the novel’s “Resources for Further Study” — how did the author miss this? Or…did he just count on the rest of us not bothering to fact check…? The story eventually makes a similar error at the end of the book, as all the evacuees at all the evacuation camps are returned to their respective villages on the same — but this time unnamed — ship. But no: again, there was more than one ship, more than than one wave of homecomings. And the villages that were not reinhabited — the “lost villages” — were not abandoned because “Half the villages had burned to the ground” (as written in the novel). The government simply refused to repatriate people to some of the villages because it judged they weren’t viable. For a more accurate account, see the National Park Service’s Lost Villages of the Eastern Aleutians: Biorka, Kashega, Makushin by Ray Hudson & Rachel Mason (2014). National Park Service publication World War II Aleut Relocation Camps in Southeast Alaska by Charles M. Mobley (2012). Also available as a series of web pages at NPS’s Aleutian World War II National Historic Area. The final village to be evacuated, Unalaska, was (and still is) just the other side of a small bay from the military facilities at Dutch Harbor. Unangax residents of Unalaska village (white residents were allowed to stay, due at least in part to racism), were not evacuated until on July 19, nearly a month after the Pribilovians arrived at Funter Bay. Unalaskans sailed to Southeast Alaska aboard the SS Alaska — the dark grey line on the map above — arriving at Wrangell Institute on July 26, where they joined the evacuees already in temporary residence there until being moved in two stages on August 12 and 14 to an abandoned cannery at Burnett Inlet on Etolin Island. 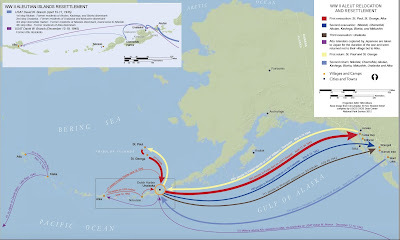 In the map above, the light blue lines with arrows pointing west represent the April 1945 return to the Eastern Aleutians of evacuees from Atka, Nikolski, Kashega, Makushin, Biorkin, Akutan, and Unalaska, sailing aboard the USAT David W. Branch. Residents of Kashega, Makushin, and Biorkin were refused repatriation to their home villages; most were settled in Unalaska. See Lost Villages of the Eastern Aleutians by Ray Hudson and Rachel Mason (2014). 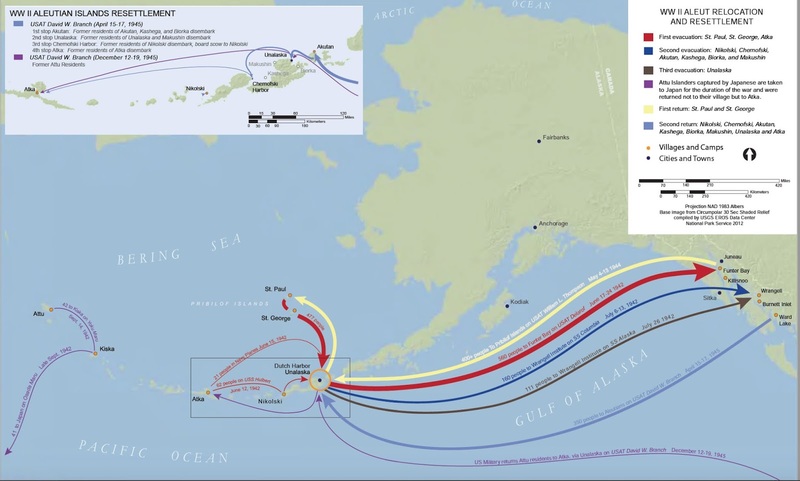 The purple lines on the map represent some of the movements of the villagers of Attu Island, who were held as prisoners in Japan until being flown in November 1945 to San Francisco then Seattle, and returned to the Aleutians on the USAT David W. Branch in December 1945. They, too, were denied repatriation to their home village, and were settled at Atka. See Attu Boy by Nick Golodoff (2012). This fictional proclamation gives the false impression that evacuations were the result of a cohesive, coordinated policy made at the top levels of government, similar to FDR’s Executive Order 9066 (signed 19 Feb 1942) that paved the way for the incarceration of Japanese Americans in internment camps. In history, as documented in CWRIC’s 1982 report Personal Justice Denied, the policies and planning (or lack of planning) that led to the evacuations were in reaction to the exigencies of war and made almost entirely by civilian and military officials in Alaska and the North Pacific, not by cabinet officials in Washington, DC. The agencies involved were three divisions of the Interior Department with responsibility for policies affecting the Unangax — the Division of Territories (including the office of Territory of Alaska Gov. Ernest Gruening); the Office of Indian Affairs (OIA), mainly responsible for education (primarily among the Unangax living in the Aleutian archipelago); and the Fish and Wildlife Service (FWS), which managed the highly profitable fur seal harvest in the Pribilof Islands, whose labor force came almost exclusively from the Unangax population of those islands — along with the Alaska Sector of the U.S. Navy’s Thirteenth Naval District, Task Force 8 of the Navy’s North Pacific Force, and the U.S. Army's Alaska Defense Command. As documented by CWRIC, Kohlhoff, and others, bad planning and poor coordination among these authorities were among the principal factors underlying the neglect and maltreatment the Unangax suffered during the war. On June 16, without consulting me or any official of this Department, our armed forces evacuated 468 natives and 20 supervisory employees of the Fish and Wildlife Service and their families from the Pribilof Islands, Alaska, moving them to Funter Bay in Southeastern Alaska, about 1,500 mile away, where presumably they would be less subject to enemy attack. Plainly in Ickes’ mind, the “interest of the nation” lay far more in the value of the fur seal and fox skins to the U.S. Treasury than in the safeguarding the lives of the Pribilof labor force — which is essentially how the U.S. had viewed the Unangax of the Pribilofs as much as the Russians did before them. (Barbara Boyle Torrey spells it out starkly in the title of her 1978 history of the Pribilof Islands: Slaves of the Harvest.) In any case, it’s clear Ickes had no part of a proclamation that placed more importance on protecting Unangax lives than on the profits of the fur seal harvest. Gathering personal belongings. In the story, Delarof troops force villages to leave their villages at gunpoint without giving them the opportunity to get any clothing or other possessions or to secure their homes. In history, evacuees of all villages except Atka (see below) were given at least some opportunity — though sometimes little more than an hour — to gather possessions. The time allowed was seldom enough for them to secure the property they left behind. Villagers were not held at gunpoint. Shooting cats and dogs. In the story, after villagers had been taken aboard ship, Delarof troops went through the villages to shoot the villagers’ cats and dogs. Kohlhoff refers to St. George villagers (who had about 24 hours to prepare) killing livestock, but I have yet to come across any account, other than the one in this novel, of military personnel shooting evacuees’ pets. Burning villages. In the story, Delarof troops burned three of the nine villages to the ground. In history, only Atka village was burned — but in circumstances very different from those depicted in the book. As documented by CWRIC and Kohlhoff, among others, Atka Islands’ Nazan Bay was being used as a seaplane base to stage raids on Japanese-occupied Kiska Island. After a Japanese reconnaissance plane was sighed over Nazan Bay on June 12, 1942, the USS Gillis was ordered to evacuate Atka & apply a “scorched-earth” policy, in order to deny the Japanese use of the village’s buildings should they also invade Atka Island. 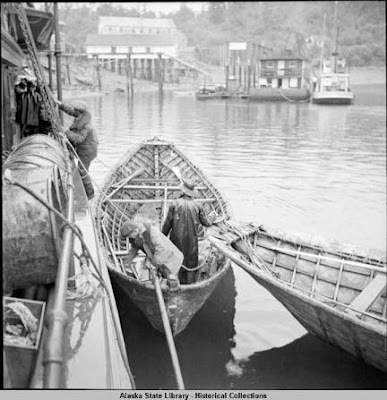 But when Gillis crew came ashore, the villagers weren’t there: they’d been advised to go to their fish camps, which were reckoned to be safer if the Japanese attacked. The Gillis evacuated the two Alaska Indian Service employees they found, torched the village as ordered, & returned to their ship. Later, the USS Hulbert spotted the Atkans coming back to see their burned village, took them aboard, and transported them to Nikolski on Umnak Island, where they stayed for three days before being taken on to Dutch Harbor. (But 21 Atkans were left stranded on Atka for three days, until two seaplanes flew them directly to Dutch Harbor.) The Atkans lost virtually everything but the clothing they were wearing. This was horrific and traumatizing — but very different from the novel’s sensationalized depiction. In any case, the USAT Delarof was never at Atka. Delarof picked up its Atka passengers days later from Dutch Harbor. Why lie to 12 to 16-year-old readers about it? Funter Bay. The only evacuation camp portrayed in the novel is Funter Bay on Admiralty Island, where St. Paul and St. George evacuees lived. But Funter Bay was actually the site of two camps: an abandoned salmon cannery on one side of the bay, where the St. Paul villagers lived; and an abandoned gold mine about one mile away across the bay, where the St. George villagers lived. They were close enough to each other to share resources and to visit back and forth, by boat or by walking around the bay. The novel shows only the cannery, making no mention whatsoever of the mine. 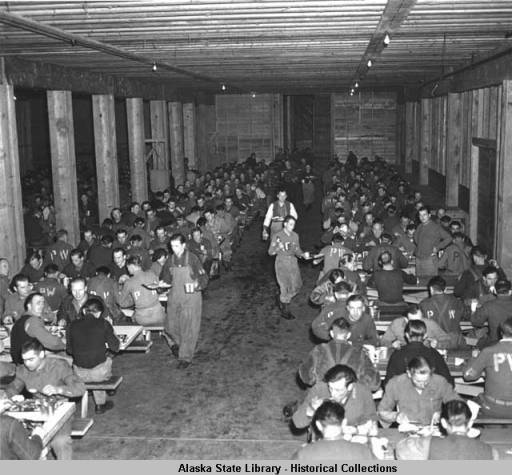 The National Park Service’s Aleutian World War II National Historic Area series on the World War II relocation camps (the web version of Mobley (2012)) documents both camps at Funter Bay — the salmon cannery and the gold mine — including maps and photos. The author is absolutely right that were many deaths at Funter Bay (as there were at the other relocation camps) — far above normal death rates. The mortality rate on St. Paul Island in the year before the war was 10.5 deaths per 1000 people. Based on this rate, there should have been no more than 10 deaths during the two years the Pribilof Islanders were at Funter Bay. Instead, 32 died there — a death rate three times higher than it should have been. The author is also correct that death disproportionately affected the very young and the very old: 14 who died were age ten or younger, and 10 were age fifty or older (Kohlhoff, 1995: 114). But the author is incorrect about what cause the majority of those deaths. Despite a major measles epidemic in 1943, only 4 the 24 deaths that year were from measles. The major killer overall at Funter Bay was pneumonia, which claimed 11 lives. Two died from tuberculosis. 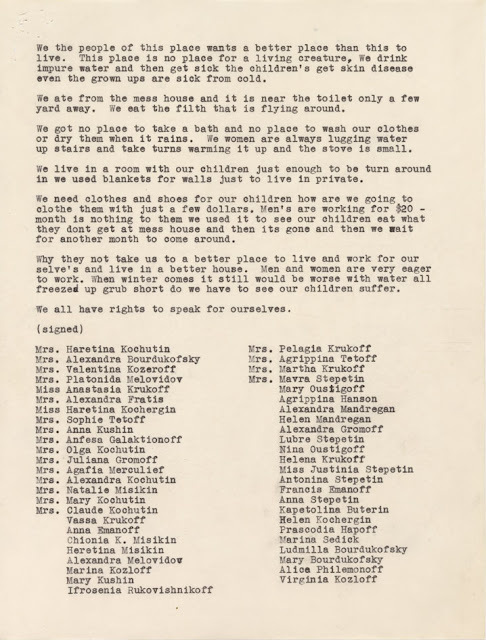 “Just before 1943, the year of highest death rates,” Kohlhoff writes, “Aleut women protestors had warned that living conditions at Funter Bay were deadly. The large number of camp deaths were not attributable only to the measles and influenza epidemic that hit in 1943: only four of the twenty-four who died [that year] succumbed to measles, and none to influenza. Funter Bay camps themselves were the problem” (p. 114). Petition of Unangax women at Funter Bay protesting conditions, 10 Oct 1942. Update, 10 Nov 2017: In the novel, Agafon is only rumored to be a shaman, as shown in Chapter 6 when Kiska’s father tells her “Some people say he's a shaman, maybe the last one." Later, Kiska asks Agafon if he is, in fact, a shaman. He smiles, doesn’t directly answer either yes or no, but goes into a brief speech explaining what shamans are and what they do. She asks him again if he’s a shaman, and he again smiles, but makes no direct answer. Thus, whether or not he is one is strongly implied, but ultimately left ambiguous. Nowhere in the story is any unequivocal statement made to the effect that “Agafon is a shaman." (Nor any unequivocal statement that he isn't one.) I apologize that I did not make this clear at the outset. Keepers. In the story, the name Funter Bay residents have for the camp manager and his “staff of guards” is “Keepers.” One part of the reason for Kiska to keep her fishing activities secret is because, as she is warned by Agafon, “if I was discovered, the Keepers would restrict my movements, and then I wouldn't be able to help anymore, and our people would continue to suffer.” Further, if the people who find the fish that Kiska has left anonymously on the path tell the Keepers about their secret benefactor, “they would take the fish for themselves.” The Keepers live in relative comfort, with good food and decent shelter, and strive to keep the evacuees from escaping camp or, apparently, having enough food. At least some of the Keepers are soldiers who prey sexually on the younger women and girls. One of them gets Kiska’s sister pregnant. They are a key feature of the novel’s depiction of the evacuation camps as “internment” camps. In history, there were no soldiers stationed as guards at Funter Bay or any of the other camps. Here is Mobley’s (2012) description of the non-Unangax residents of Funter Bay when the evacuees first arrived: “The two USFWS employees (St. George agent Daniel C.R. Benson and acting St. Paul agent Carl M. Hoverson) and their wives, and the two school teachers from St. Paul — Mr. and Mrs. Helbaum — and their two children, stayed at Funter Bay with the villagers” (p. 28). The actual (rather than acting) St. Paul agent, Lee McMillin, features prominently in Kohlhoff’s history. (Hoverson was more accurately a storekeeper.) There was also the St. George village priest, who lived at the gold mine camp with other St. George evacuees (Mobley, 2012: 68). While none of these people were soldiers or “guards,” the FWS Sealing Division personnel did try to keep Funter Bay’s evacuees contained in the camp, fearing that if the Pribilovians got jobs outside the camp — in nearby Juneau, at the defense project at Excursion Inlet (see below), or elsewhere — it would be hard to get them back in time to go back to the Pribilofs during summer 1943 for the lucrative fur seal harvest. For all intents and purposes, from the time of the U.S. purchase of Alaska in 1867, the Unangax of St. Paul and St. George had been treated by the Interior Department as a captive labor force — as slaves. McMillin didn’t believe the Unangax were subject to the draft because he didn’t believe they were even American citizens. But World War II taught him differently: At least twenty-five Unangax men (including a number from Funter Bay) were drafted or otherwise joined the military during World War II, including three who were awarded the Bronze Star for their part in the May 1943 battle that retook Attu Island from the Japanese (National Park Service, 2017). Moreover, back at Funter Bay, Unangax defied attempts by McMillin and other FWS personnel to control them. “Within the first six months [at Funter Bay],” Kohlhoff (1995) writes, “there were 135 Pribilof people working outside Funter Bay, mostly in Juneau” — about 28 percent of the population. This included eight women. A year later, about 200 — half the camp — worked outside the camp (p. 111), and all of this against the wishes of the FWS camp management. A word about Peter: at one point he declares “We have to fight back like . . . like the French Resistance.” He makes this declaration early after his arrival at Funter Bay, sometime after the others arrived, as he’d been away from the village at the time of the evacuation. And so he ended up stranded alone for several days in the Aleutians after everyone else was gone — with no radio, no newspapers, no access at all to information about the war in Europe, much less about the French Resistance. Once reunited with his family Peter’s “resistance” mainly involves malicious pranks played on the “Keepers.” The more meaningful resistance of Unangax defying FWS attempts to control their ability to make a livelihood on their own terms goes entirely unmentioned. Oktoberfest at Excursion Inlet. In the story, a chapter titled “Oktoberfest” set in October 1942 shows the manager of the Funter Bay camp calling for a work detail “to make repairs on a prisoner-of-war camp for captured Germans about thirty miles away on Excursion Bay.” Kiska goes with the crew, dressed in men’s clothing to conceal her “girlness,” so that she can satisfy her curiosity about the conditions in which the German POWs are being kept — vastly superior to the poor conditions at Funter Bay. Period photographs at the back of the book include three photos, courtesy the Alaska State Library, showing the canteen, living quarters, and mess hall at the POW camp. In history, the correct name of the place was (and still is) Excursion Inlet — not Excursion Bay — and there were no German POWs there until August 1945, after Germany’s surrender but prior to Japan’s. The POWs were brought to Excursion Inlet to help dismantle a formerly secret military installation, the Alaska Barge Terminal (officially the Excursion Inlet Subport of Embarcation), which had been built over a 15-month period beginning in August 1942 as a staging area for a potential invasion of Japan from the North Pacific. But by the time the project was completed in November 1943, the Japanese had been expelled from the Aleutians, and the facility was mothballed. “German POWs helped dismantle SE Alaska’s ‘White Elephant’” by Dave Kiffner (SitNews [Ketchikan, AK], 17 Feb 2015) has the story, along with the same photos from the Alaska State Library that are included at the back of the novel. Then there’s the source of the photos themselves: the Alaska State Library website. There, you might note the clear labeling of the dates of the camp: “Prisoners of War Camp (German prisoners) Excursion Inlet, Alaska. August-November, 1945.” These dates are notably absent from the presentation of the photos at the back of the book, despite other information which properly cites their source. The point is that there’s a nearly three-year difference in the timeline between October 1942, when Kiska fictionally visited their camp, and August 1945 when these former Afrika Korps soldiers arrived at Excursion Inlet. In fact, the evacuees of Funter Bay had already returned to their homes in the Pribilof Islands in May 1944 more than a full year before the German POWs even arrived in Alaska. The Unangax in the other Southeast Alaska relocation camps had gone back to the Aleutians no later than May 1945, three months before the German POWs came up. Unless they had a time machine, they couldn’t possibly have met any German POWs. This is not to say that no Unangax ever went to Excursion Inlet in 1942–1943: At least 13 Atkans from the Killisnoo Bay camp and 14 evacuees from the Ward Lake camp worked to build the Alaska Barge Terminal defense project at Excursion Inlet (Kohlhoff, 1995: 121, 127). One of the problems FWS faced getting Funter Bay evacuees back to the Pribilofs to work the summer 1943 fur seal harvest was that “At Excursion Inlet, some Aleuts were employed in a defense project and were ‘making from $50 to over $100 weekly plus allowances.’ It would be difficult for the Sealing Division to compete” (Kohlhoff, 1995: 111-112). It’s nonetheless possible that he met Sen. Stevens in 1986, as he later did in 1996. But it’s unlikely that Sen. Stevens needed his assistance to document the “heartrending stories” of Unangax elders. The Unangax had already been doing the work themselves for years. Transformed by their experience in the relocation camps — angry at what they’d suffered in the camps (disease and death, neglect, racism…) and on return home (homes and property stolen and vandalized by American servicemen), newly awake to opportunities that the FWS and other government entities had isolated them from, allied with politically engaged Alaska Natives they’d befriended in Southeast, such as the Alaska Native Brotherhood — they organized themselves to assert their dignity, their sovereignty, and their right to redress. In 1978, the Aleutian/Pribilof Islands Association (APIA) retained a lawyer named John C. Kirtland, who worked with the Alaska congressional delegation, including Sen. Stevens, to push an amendment to the Commission on Wartime Relocation and Internment of Civilians (CWRIC) Act (enacted in 1980 as Public Law 96-317), to add the investigation of the Unangax evacuation and relocation to the CWRIC’s mandate to investigate the Japanese American internments. Then Kirtland and APIA got the Alaska Legislature and governor to appropriate the funds to gather Unangax testimony. The result: a “memorandum in equity law with voluminous documentation” — the 9-volume “The Relocation and Internment of the Aleuts During World War II” (available on CD from the Aleutian/Pribilof Islands Association). The APIA also mobilized survivors of the camps to CWRIC hearings held in September 1981 in Anchorage, Unalaska, and St. Paul, resulting in in-person testimony from 53 Unangax witnesses and a further 135 depositions and written testimonies. All this testimony, assembled by the Unangax themselves with the help of their lawyers, formed the basis for the Aleut section of the CWRIC report, Personal Justice Denied: Report of the Commission on Wartime Relocation and Internment of Civilians, published in 1982. The CWRIC report paved the way for the legislation for redress that was eventually enacted by Congress and signed by President Reagan in 1988. In fact its findings were described at length in a speech in by Sen. Stevens in support of legislation to implement CWRIC’s findings, including Title III of the bill — the Aleutian and Pribilof Islands Restitution Act. This speech was made on the floor of the Senate on May 2, 1985 (beginning p. 10268) — a year before his supposed request for help from the author. It’s shameful for someone who writes a “historical novel” that so profoundly distorts history to claim himself as instrumental in an effort in which he was at most (to be generous) a latecomer. A last niggle or two. There are a few examples in this novel of idioms that just don’t seem to fit the time period of 1942–1945. For example, Kiska in Chapter 7 informs her brother that “You’re not the boss of me” — a phrasing I never heard until becoming parent to a defiant 9-year-old in 1996. But in a book written to appeal to YAs — okay, I get it. According to the story, Kiska turned 14 in 1942. That would make her 30 in 1958. (Alaska became a state on January 3, 1959). For her to be a grandmother at age 30, her granddaughter couldn't have been anymore than one or two years old, without the language development to comprehend Kiska's story, nor the physical capacity to obey her grandmother’s request in the first sentence of the story: "Pour me another cup of tea and sit down, Granddaughter." That’s just one more sign of this author’s carelessness in this novel. 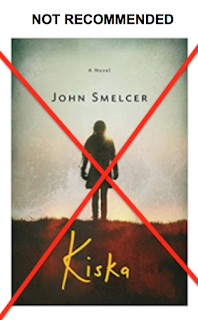 I haven’t covered every inaccuracy or problem with this novel — just what stood out most obviously. 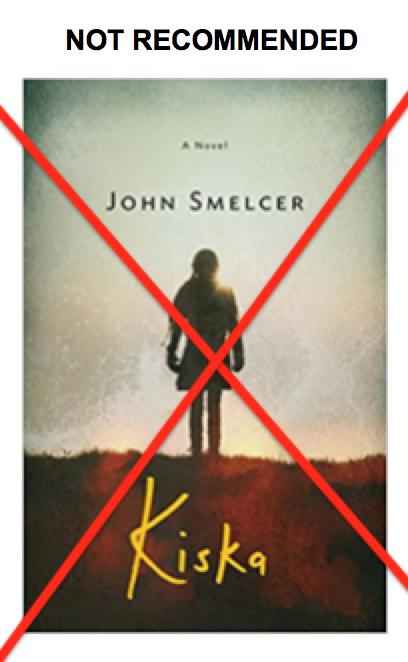 The verdict is: Kiska is not “historical fiction.” It’s just fiction. Mixed in with those elements that are true to history (there are a few, believe it or not) are so many distortions — not only in the story itself, but also in the “Questions for Discussion” that supplement the book — as to make this book entirely useless as a means for any reader to understand the Unangax experience of the war or what followed it. The best educational use of this book would be to assign it as an exercise in fact-checking. Some of the professional reviewers who have reviewed this book could certainly benefit from such an exercise. 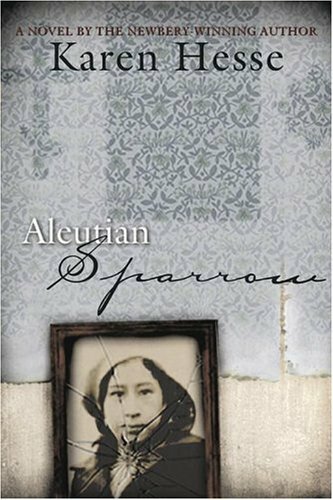 A better choice for young adult readers would be Karen Hesse’s Aleutian Sparrow (2005), a historical novel in free verse about a teenage girl from the Unalaska Island village of Kashega, whose residents were evacuated to the old Civilian Conservation Corps at Ward Lake (near Ketchikan). Hesse’s book successfully conveys Unangax ways without resorting to stereotype (something that can’t be said for Kiska), including a more accurate depiction of the actual activities Unalaska Islanders pursued for their livelihoods in 1942; and also conveys all the confusion, suffering, and loss of the evacuation camp experience. Please read accounts by the actual people who lived through this horrendous time to see how all the people at Funter Bay & the other evacuation camps worked tenaciously to care for themselves and their families. They hunted. They fished. They even got jobs away from the camps. After the war ended, they fought tenaciously for their rights so that such a thing might never happen again. They didn’t just sit there waiting to be “saved.” If you read such stories, you’ll know that the young hero the author tries to make his character Kiska out to be shouldn’t have been designed as an “outsider” at all. To be heroic, she’d just have to be one among her people, the Unangax of the Pribilof and Aleutian Islands. Carlson, Phyllis Downing; & Bill, Laurel Downing. (2012). Aunt Phil’s Trunk, Volume 4: 1935–1960 (2nd ed.). Anchorage, AK: Aunt Phil’s Trunk LLC. Entertaining (and accurate) stories of Alaska history with lots of photos; includes chapters on the Unangax relocation, the wider war in the Aleutians, and the German POWs at Excursion Inlet. Commission on Wartime Relocation And Internment of Civilians (CWRIC). (1982). Personal Justice Denied: Report of the Commission on Wartime Relocation and Internment of Civilians. Washington, DC: U.S. Government Printing Office. Estlack, Russell W. (2014). The Aleut Internments of World War II: Islanders Removed From Their Homes By Japan and the United States. Jefferson, NC: McFarland. Golodoff, Nick. (2012). Attu Boy. Anchorage, AK: National Park Service, Aleutian World War II National Historic Area. The true story of an Attu villager held as a prisoner by the Japanese. A second edition (same content but different ordering) was published by University of Alaska Press as Attu Boy: A Young Alaskan's WWII Memoir (2015). Hesse, Karen. (2005). Aleutian Sparrow. Margaret K. McElderry Books. A historical novel in free verse about a young Unangax evacuated to Ward Cove. Hillman, Anne; Mason, Rachel; & Petrivelli, Pat. (2017). “75th Anniversary of Aleut Evacuation” 59 mins. Talk of Alaska [radio broadcast]: Alaska Public Media. My local public radio broadcaster. Hosted by Anne Hillman; Rachel Mason is an (actual) cultural anthropologist with the Aleutian World War II National Historical Area of the National Park Service; Pat Petrivelli is the daughter of Atka village evacuee and Unangax leader Alice Snigaroff Petrivelli. Kiffer, Dave. (2015). “German POWs Helped Dismantle Se Alaska’s ‘White Elephant’.” SitNews [Ketchikan, AK], 17 Feb 2015. Hudson, Ray; & Mason, Rachel. (2014). Lost Villages of the Eastern Aleutians: Biorka, Kashega, Makushin. Anchorage, AK: National Park Service, Alaska Region. Kirtland, John C.; & Coffin, David F., Jr. (1981). The Relocation and Internment of the Aleuts During World War II. Anchorage, AK: Aleutian/Pribilof Islands Association. Kohlhoff, Dean. (1995). When the Wind Was a River: Aleut Evacuation in World War II. Seattle, WA: University of Washington Press. Merculieff, Ilarion. (2016). Wisdom Keeper: One Man’s Journey to Honor the Untold History of the Unangax People. Berkeley, CA: North Atlantic Books. Merculieff is a modern Unangax leader born on St. Paul Island, whose parents met as teenagers at the Funter Bay evacuation camp. Mobley, Charles M. (2012). World War II Aleut Relocation Camps in Southeast Alaska. Anchorage, AK: National Park Service, Alaska Region. Contents of this book are also kept up to date as a series of web pages at NPS’s Aleutian World War II National Historic Area. National Park Service. (2017). “Unangax̂ (Aleut) Evacuation & Internment” (web page). National Park Service, Aleutian World War II National Historic Area, Alaska. Schlung, Tyler M., Nikolski School, & Pels, Jacqueline (eds.). (2003). Umnak: The People Remember. Walnut Creek, CA: Hardscratch Press. This compilation by Nikolski village students, edited by their teacher, covers the history and culture of Nikolski on Umnak Island. Stevens, Sen. Ted. (1985). Congressional Record, 2 May 1985: 10268-10269. Statement of Sen. Stevens in support of “S. 1053 — Legislation to Implement Recommendations of Commission on Wartime Relocation and Internment of Civilians” and requesting unanimous consent (which was granted) to print a section-by-section summary of Title III of the bill — the Aleutian and Pribilof Islands Restitution Act — in the Congressional Record. Torrey, Barbara Boyle. (1978). Slaves of the Harvest. Anchorage, AK: Tanadgusix Corporation. A history of St. Paul and St. George in the Pribilof Islands.